Look out, Mazda’s done it again! They’ve taken the auto industry by storm with another KODO-designed vehicle that looks absolutely awesome and offers up a dynamic drive. Once again, they’ve delivered an impressive vehicle that checks all the right boxes for a variety of needs and wants. Way to go, Mazda. A spunky little compact crossover, the small-but-mighty CX-3 slots itself perfectly just below the japanese auto-maker's well-loved CX-5. And while it might be small in size, it offers a larger-than-life driving experience. The 2016 Mazda CX-3 offers Mazda quality along with a lengthy warranty and all the SKYACTIV technology you could ever hope to have. 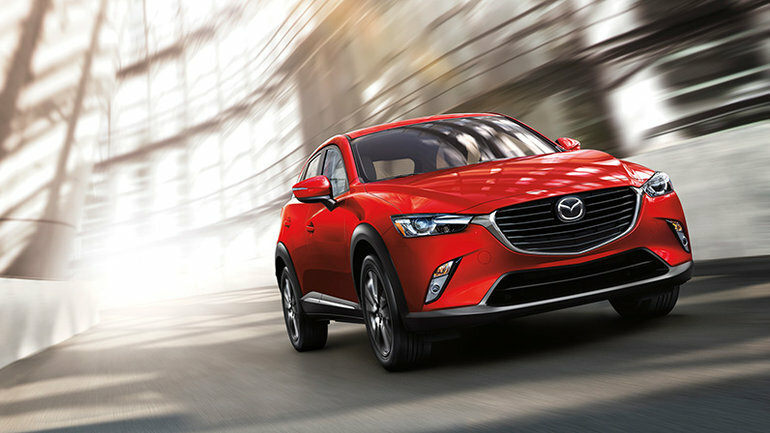 Really, we can’t say it enough: The 2016 Mazda CX-3 looks ridiculously good. It’s squat, taught, perfectly proportioned, and has one of the best-looking front ends in the industry -- in short, it's eye-catching in all the best ways. This compact crossover turns heads no matter where it goes thanks, in no small part, to its fantastic KODO design language that’s expertly executed on this small-but-mighty vehicle. Sit inside the 2016 Mazda CX-3 and you’ll be greeted with a design that’s aesthetically pleasing and oh-so-easy to use. The CX-3 is equipped with Mazda’s new HMI, as well as a floating screen in the dash and a selector knob near the shifter and armrest. The 2016 Mazda CX-3 comes equipped with a truly impressive SKYACTIV 2.0L 4-cylinder mill that produces 146 horsepower and the same amount of torque. For now, the only transmission choice is a SKYACTIV-drive automatic. The duo work together harmoniously and offer up a dynamic drive that really sells the CX-3 as one of the best driving experiences for a compact crossover currently on the market. Of the three 2016 Mazda CX-3 models, each is available in either front- and all-wheel drive (optional on the GX and GS but standard on the GT). The added AWD option means the CX-3 is a superbly winter-ready small family vehicle. The all-new 2016 Mazda CX-3 is absolutely gorgeous, and gobs of fun to drive, as well. To find out more about this mighty compact crossover, head down to City Mazda today to speak to one of our experts. And don’t forget to book a test drive, too!